Sardar Bhagat Singh was born on 27 September 1907 at Banga in Lyallpur district (now Pakistan) to Kishan Singh and Vidya Vati. From his early childhood, Bhagat Singh was imbued with the family’s spirit of patriotism. At the time of his birth, his father Kishan Singh was in jail. His uncle, Sardar Ajit Singh, was a great freedom fighter and established the Indian Patriots’ Association. He was well-supported by his friend Syed Haidar Raza, in organizing the peasants against the Chenab Canal Colony Bill. Ajit Singh had 22 cases against him and was forced to flee to Iran. 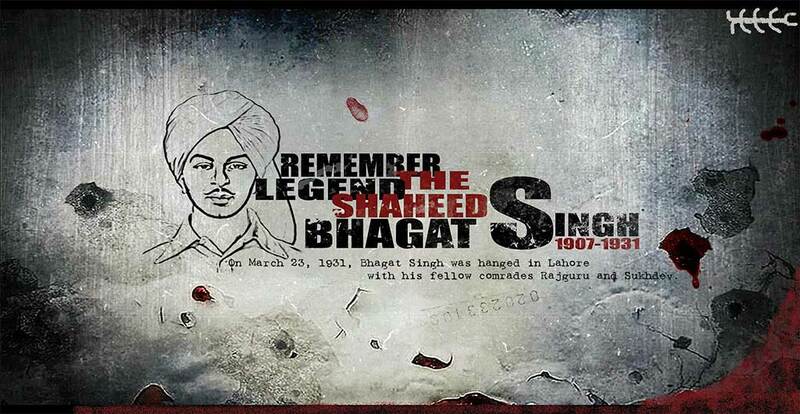 Bhagat Singh was considered to be one of the most influential revolutionaries of Indian Nationalist Movement. He became involved with numerous revolutionary organizations. Kishan Singh enrolled Bhagat Singh in Dayanand Anglo Vedic High School. At a very young age, Bhagat Singh started following Non-Cooperation Movement called by Mahatma Gandhi. Bhagat Singh had openly defied the British and had followed Gandhi’s wishes by burning the government-sponsored books. Following the violent incidents of “Chauri Chaura”, Gandhi called for the withdrawal of the Non-Cooperation movement. Unhappy with the decision, Bhagat Singh, isolated himself from Gandhi’s nonviolent action and joined the Young Revolutionary Movement. He was pursuing B.A. examination when his parents planned to have him married. He vehemently rejected the suggestion and said that, if his marriage was to take place in Slave-India, my bride shall be only death.” Singh later joined the Hindustan Republican Association, a radical group, later known as the Hindustan Socialist Republican Association. He returned to his home in Lahore after assurances from his parents that he would not be compelled to get married. He established contact with the members of the Kirti Kisan Party and started contributing regularly to its magazine, the “Kirti”. In March 1926, the Naujawan Bharat Sabha was formed with Bhagat Singh, as its secretary. In 1928, the British government set up the Simon Commission to report on the political situation in India. Some Indian political parties boycotted the Commission because it did not include a single Indian in its membershipand there were protests across the country. When the Commission visited Lahore on 30 October 1928, Lala Lajpat Rai led a march in protest against the Commission. Police attempts to disperse the large crowd resulted in violence. The superintendent of police, James A. Scott, ordered the police to lathi charge the protesters and personally assaulted Rai, who was injured. Rai died of a heart attack on 17 November 1928. Doctors thought that his death might have been hastened by the injuries that he had received. When the matter was raised in the Parliament of the United Kingdom, the British Government denied any role in Rai’s death. Bhagat was a prominent member of the HRA and was probably in large part responsible for its change of name to HSRA in 1928. The HSRA vowed to avenge Rai’s death. Singh conspired with revolutionaries like Shivaram Rajguru, Sukhdev Thapar and Chandrashekhar Azad to kill Scott. However, in a case of mistaken identity, the plotters shot John P. Saunders, an Assistant Superintendent of Police, as he was leaving the District Police Headquarters in Lahore on 17 December 1928. After killing Saunders, the group escaped through the D.A.V. College entrance, across the road. Chanan Singh, aHead Constable who was chasing them, was fatally injured by Chandrashekhar Azad’s covering fire. They then fled on bicycles to pre-arranged places of safety. The police launched a massive search operation to catch them, blocking all exits and entrances from the city; the CID kept a watch on all young men leaving Lahore. They hid for the next two days. On 19 December 1928, Sukhdev called on Durgawati Devi, sometimes known as Durga Bhabhi, wife of another HSRA member Bhagwati Charan Vohra, for help, which she agreed to do. They decided to catch the train departing from Lahore to Bathinda en route for Howrah (Calcutta) early the next morning. Singh and Rajguru left the house early the next morning, with both men carrying loaded revolvers. Dressed in western attire and carrying Devi’s sleeping child, Singh and Devi passed off as a young couple, while Rajguru carried their luggage as their servant. At the station, Singh managed to conceal his identity while buying tickets and the three boarded the train heading to Cawnpore. There they boarded a train for Lucknow since the CID at Howrah railway station usually scrutinised passengers on the direct train from Lahore. At Lucknow, Rajguru left separately forBenares while Singh, Devi and the infant went to Howrah, with all except Singh returning to Lahore a few days later. Singh had for some time been exploiting the power of drama as a means to inspire revolt against the British, purchasing a magic lantern to show slides that enlivened his talks about revolutionaries who had died as a result of the Kakori Conspiracy, such as Ram Prasad Bismil. In 1929, he proposed a dramatic act to the HSRA with the intention of gaining massive publicity for their aims. Influenced by Auguste Vaillant, a French anarchist who had bombed the Chamber of Deputies in Paris, Singh’s plan was to explode a bomb inside the Central Legislative Assembly. The nominal intention was to protest against the Public Safety Bill and the Trade Dispute Act, which had been rejected by the Assembly but were being enacted by the Viceroy using his special powers; the actual intention was for the perpetrators to get themselves arrested so that they could use appearances in court as a stage to publicise their cause. The HSRA leadership were initially opposed to participation of Bhagat in the bombing because they were certain that his prior involvement in the Saunders shooting would means that his apprehension on this occasion would ultimately result in his execution. However, they eventually determined that he was their most suitable candidate. On 8 April 1929, Singh, accompanied by Batukeshwar Dutt, threw two bombs into the Assembly chamber from its public gallery while it was in session.The bombs had been designed not to kill but some members were injured, includingGeorge Ernest Schuster, the finance member of the Viceroy’s Executive Council. The smoke from the bombs filled the Assembly and they probably could have escaped in the confusion if they wanted; instead they stayed, shouting slogans of Inquilab Zindabad! (“Long Live the Revolution”) and showered leaflets. The two men were arrested and subsequently moved through a series of jails in Delhi. We hold human life sacred beyond words. We are neither perpetrators of dastardly outrages … nor are we ‘lunatics’ as the Tribune of Lahore and some others would have it believed … Force when aggressively applied is ‘violence’ and is, therefore, morally unjustifiable, but when it is used in the furtherance of a legitimate cause, it has its moral justification. The trial started in the first week of June, following a preliminary hearing in May. On 12 June, both men were sentenced to life imprisonment for “causing explosions of a nature likely to endanger life, unlawfully and maliciously.” Dutt had been defended by Asaf Ali, while Singh defended himself. Doubts have been raised about the accuracy of testimony offered at the trial. One key discrepancy refers to the automatic pistol that Singh had been carrying when he was arrested. Some witnesses said that he had fired two or three shots, while the police sergeant who arrested him testified that the gun was pointed downward when he took it from him and that Singh “was playing with it.” According to the India Law Journal, which believes that the prosecution witnesses were coached, these accounts were incorrect and Singh had turned over the pistol himself. The HSRA had set up bomb factories in Lahore and Saharanpur in 1929. On 15 April 1929, the Lahore bomb factory was discovered by the police, leading to the arrest of other members of HSRA, including Sukhdev, Kishori Lal and Jai Gopal. Not long after this, the Saharanpur factory was also raided and further conspirators became informants. With the new information available, the police were able to connect the three strands of the Saunders murder, Assembly bombing and bomb manufacture. Singh, Sukhdev, Rajguru and 21 others were charged with the Saunders murder. Singh was re-arrested for murdering Saunders and Chanan Singh based on substantial evidence against him, including the statements of his associates, Hans Raj Vohra and Jai Gopal. His life sentence in the Assembly Bomb case was deferred till the Saunders’ case was decided. He was sent to Central Jail Mianwali from the Delhi jail, where he witnessed discrimination between European and Indian prisoners. He considered himself and others to bepolitical prisoners, noted that he had received an enhanced diet at Delhi but was not doing so at Mianwali, and led other Indian self-identified political prisoners, whom he felt were being treated as common criminals, in a hunger strike. They demanded equality in food standards, clothing, toiletries and other hygienic necessities, as well as availability of books and a daily newspaper, whom they demanded should not be forced to do manual labour or any undignified work in the jail. The hunger strike inspired a rise in public support for Singh and his colleagues from around June 1929. The Tribunenewspaper was particularly prominent in this movement and reported on mass meetings in places such as Lahore and Amritsar. The government had to apply Section 144 of the criminal code in an attempt to limit gatherings. The man who goes on hunger strike has a soul. He is moved by that soul, and he believes in the justice of his cause … however much you deplore them and however much you say they are misguided, it is the system, this damnable system of governance, which is resented by the people. The government tried to break the strike by placing different food items in the prison cells to test the prisoners’ resolve. Water pitchers were filled with milk so that either the prisoners remained thirsty or broke their strike but nobody faltered and the impasse continued. The authorities then attempted force-feeding the prisoners but were resisted. With the matter still unresolved, the Indian Viceroy, Lord Irwin, broke his vacation in Simla to discuss the situation with the jail authorities. Since the activities of the hunger strikers had gained popularity and attention amongst the people nationwide, the government decided to advance the start of the Saunders murder trial, which was henceforth called the Lahore Conspiracy Case. Singh was transported to Borstal Jail, Lahore, and the trial of this case began there on 10 July 1929. In addition to charging them for the murder of Saunders, Singh and 27 other prisoners were charged with plotting a conspiracy to murder Scott and waging a war against the King. Singh, still on hunger strike, had to be carried to the court handcuffed on a stretcher: he had lost 14 pounds (6.4 kg) weight from 133 pounds (60 kg) before the strike. The government was beginning to make concessions but refused to move on the core issue of recognising the classification of “political prisoner”. In the eyes of officials, if someone broke the law then that was a personal act, not a political one, and they were common criminals. By now, the condition of another hunger striker, Jatindra Nath Das, lodged in the same jail had deteriorated considerably. The Jail committee recommended his unconditional release, but the government rejected the suggestion and offered to release him on bail. On 13 September 1929, Das died after a 63-day hunger strike. Almost all the nationalist leaders in the country paid tribute to Das’ death. Mohammad Alam and Gopi Chand Bhargava resigned from the Punjab Legislative Council in protest, and Nehru moved a successful adjournment motion in the Central Assembly as a censure against the “inhumane treatment” of the Lahore prisoners. Singh finally heeded a resolution of the Congress party and a request of his father, ending his hunger strike on 5 October 1929 after 116 days. During this period, Singh’s popularity among common Indians extended beyond Punjab. Singh’s attention now turned to his trial, where he was to face a Crown prosecution team comprising C. H. Carden-Noad, Kalandar Ali Khan, Jai Gopal Lal and the prosecuting inspector, Bakshi Dina Nath. The defence was composed of eight lawyers. Prem Dutt Verma, the youngest amongst the 24 accused, threw his slipper at Gopal when he turned into a prosecution witness in court. The magistrate ordered that thereafter all the accused should be handcuffed. Singh and others refused to be handcuffed and were therefore subjected to brutal beating. The revolutionaries refused to attend the court and Singh wrote a letter to the magistrate citing various reasons why they had done so. The trial was henceforth ordered to be carried out in the absence of the accused or members of the HSRA. This was a setback for Singh as he could no longer use the trial as a forum to publicise his views. To speed up the slow trial, the Viceroy, Lord Irwin, declared an emergency on 1 May 1930, and promulgated an ordinance setting up a special tribunal composed of three high court judges for this case. The ordinance cut short the normal process of justice as the only appeal after the tribunal was at the Privy Council located in England. The Tribunal was authorised to function without the presence of any of the accused in court, and to accept death of the persons giving evidence as a concession to the defence. Consequent to the Lahore Conspiracy Case Ordinance No. 3 of 1930, the trial was transferred from Kishan’s court to the tribunal, which comprised Justice J. Coldstream, Justice G. C. Hilton and Justice Agha Hyder. The case proceedings commenced on 5 May 1930 in Poonch House, Lahore against 18 accused. On 20 June 1930, the constitution of the Special Tribunal was changed to Justice G. C. Hilton (president), Justice J. K. Tapp and Justice Sir Abdul Qadir. On 2 July 1930, a habeas corpus petition was filed in the High Court challenging the ordinance and said that it was ultra vires and therefore illegal, stating that the Viceroy had no powers to shorten the customary process of determining justice. The petition argued that the Defence of India Act 1915 allowed the Viceroy to introduce an ordinance and set up such a tribunal only under conditions of a breakdown of law-and-order, which it was claimed had not happened. However, the petition was dismissed as being premature. Carden-Noad presented the government’s grievous charges of conducting robberies and illegal acquisition of arms and ammunition amongst others. The evidence of G. T. H. Hamilton Harding, the Lahore superintendent of police, shocked the court. He stated that he had filed the First Information Report against the accused under specific orders from the chief secretary to the governor of Punjab and that he was unaware of the details of the case. The prosecution mainly depended upon the evidence of P. N. Ghosh, Hans Raj Vohra and Jai Gopal who had been Singh’s associates in the HSRA. On 10 July 1930, the tribunal decided to press charges against only 15 of the 18 accused, and allowed their petitions to be taken up for hearing the next day. The trial ended on 30 September 1930. The three accused against whom the case was withdrawn included Dutt, who had already been awarded a life sentence in the Assembly bomb case. The ordinance (and the tribunal) would lapse on 31 October 1930 as it had not been passed in the Central Assembly or the British Parliament. On 7 October 1930, the tribunal delivered its 300-page judgement based on all the evidence and concluded that participation of Singh, Sukhdev and Rajguru was proved beyond reasonable doubt in Saunders’ murder. They were sentenced to death by hanging. The remaining twelve accused were all sentenced to rigorous life imprisonment. In Punjab province, a defence committee drew up a plan to appeal to the Privy Council. Singh was initially against the appeal, but later agreed to it in the hope that the appeal would popularise the HSRA in Britain. The appellants claimed that the ordinance which created the tribunal was invalid, while the government countered that the Viceroy was completely empowered to create such a tribunal. The appeal was dismissed by Judge Viscount Dunedin. While returning Gandhiji asked me if he could talk about the case of Bhagat Singh, because newspapers had come out with the news of his slated hanging on March 24th. It would be a very unfortunate day because on that day the new president of the Congress had to reach Karachi and there would be a lot of hot discussion. I explained to him that I had given a very careful thought to it but I did not find any basis to convince myself to commute the sentence. It appeared he found my reasoning weighty. A plan to rescue Singh and fellow HSRA inmates from the jail failed. HSRA member Durga Devi’s husband, Bhagwati Charan Vohra, attempted to manufacture bombs for the purpose, but died when they exploded accidentally. Singh, Rajguru and Sukhdev were sentenced to death in the Lahore conspiracy case and ordered to be hanged on 24 March 1931. The schedule was moved forward by 11 hours and the three were hanged on 23 March 1931 at 7:30 pm in Lahore jail. It is reported that no magistrate of the time was willing to supervise his hanging as was required by law. The execution was supervised by an honorary judge, who also signed the three death warrants as their original warrants had expired. The jail authorities then broke the rear wall of the jail and secretly cremated the three men under cover of darkness outside Ganda Singh Wala village, and then threw the ashes into the Sutlejriver, about 10 kilometres (6.2 mi) from Ferozepore. Singh’s trial has been described by the Supreme Court as “contrary to the fundamental doctrine of criminal jurisprudence” because there was no opportunity for the accused to defend themselves. The Special Tribunal was a departure from the normal procedure adopted for a trial and its decision could only be appealed to the Privy Council located in Britain. The accused were absent from the court and the judgement was passed ex-parte. The ordinance, which was introduced by the Viceroy to form the Special Tribunal, was never approved by the Central Assembly or the British Parliament, and it eventually lapsed without any legal or constitutional sanctity. Bhagat Singh did not wish to live. He refused to apologise, or even file an appeal. Bhagat Singh was not a devotee of non-violence, but he did not subscribe to the religion of violence. He took to violence due to helplessness and to defend his homeland. In his last letter, Bhagat Singh wrote, ” I have been arrested while waging a war. For me there can be no gallows. Put me into the mouth of a cannon and blow me off.” These heroes had conquered the fear of death. Let us bow to them a thousand times for their heroism.